When I first lived in Venice as student, I remember crossing the city from Dorsoduro to reach the Fondamente Nuove for day-trips to explore the islands: the cemetery island of San Michele, the glass island of Murano, the first island of Torcello, the picturesque island of Burano, the fascinating island of San Lazzaro degli Armeni. 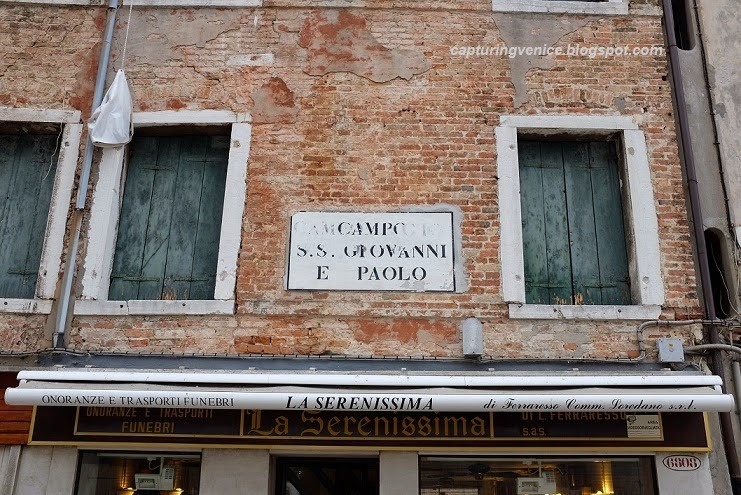 To reach the Fondamente Nuove, I'd always walk through Campo SS Giovanni e Paolo - which was always known to me in the dialect form of Campo San Zanipolo. In my head, it's still 'San Zanipolo', no matter what the 'nizioletto' indicates! My memory of San Zanipolo is of an area filled with funeral homes, and the walk to the vaporetto stop at Fondamente Nuove was filled with the businesses of funerary stonemasons. I remember the tomb stones and statues all lined up for display outside their shops. I don't recall having seen a single stonemason's shop on my most recent visit (and I looked! ), although the 'nizioletto' in the square is placed above a funeral home, as you see from the photo. This is a gorgeous campo - filled with small bars (including my favourite breakfast stop, Rosa Salva), a bookshop, and dominated by the huge Gothic structure of San Zanipolo which houses 25 of Venice's doges. 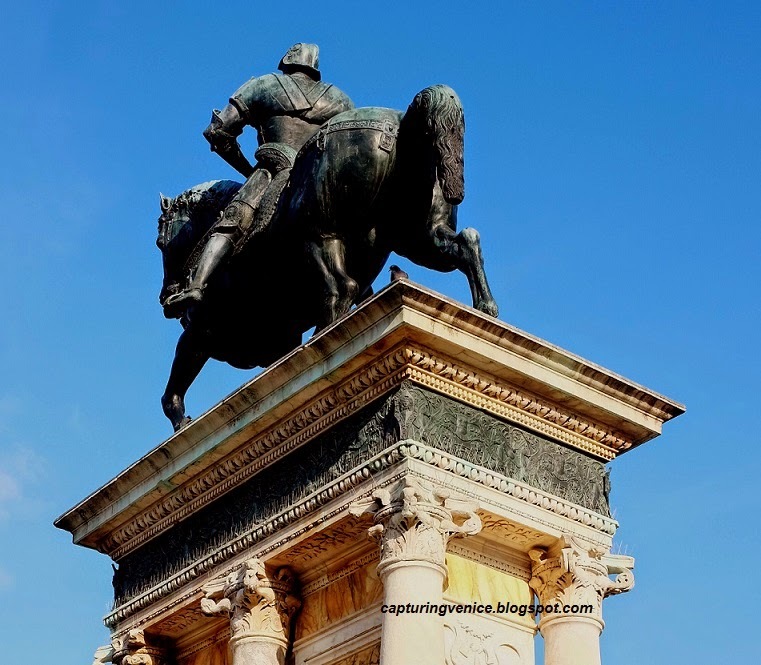 I love that magnificent statue of the condottiere, Bartolomeo Colleoni by Verocchio which stands outside the elegant facade of the Scuola di San Marco, now Venice's hospital. 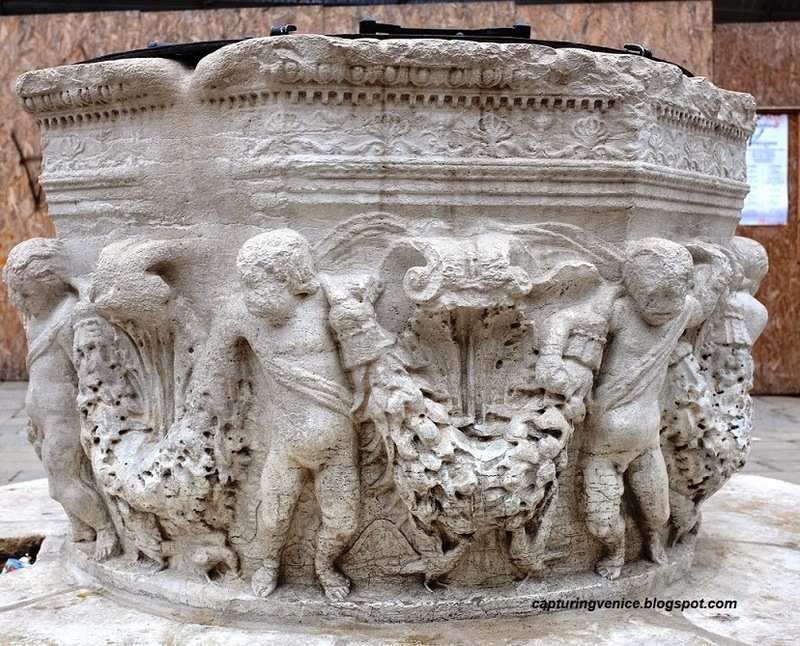 Nearby is a lovely well-head, decorated with putti.